"Everest for me, and I believe for the world, is the physical and symbolic manifestation of overcoming odds to achieve a dream." "Technique and ability alone do not get you to the top; it is the willpower that is the most important. This willpower you cannot buy with money or be given by others ... it rises from your heart"
All of the challenges are hidden deep within the grounds of your venue. Your only guide is a map which must stay at base camp. 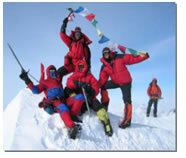 The base camp team must guide half of the group who are the mountaineers to the challenge location by radio. Once at the location the mountaineers must guide the base camp team through a safe path to the challenge. After each challenge is completed teams are rewarded with rope. They now return to base camp, rope up their progress, and the process starts again, only this time the base camp and mountaineer teams swap roles. Teams can choose which challenges they attempt from briefing sheets which are held at base camp. Upon your ascent to the famous Khumba Icefall you discover an open crevasse. By using only limited resources your team must cross this crevasse and transport the equipment safely to the other side. This is very low level and safe activity. This is an innovative way in which actual climbers ascend up a rope. The teams challenge is to scale a small section to retrieve lost rope using the amazing prusik system. You are nearing camp 1 after heavy snow fall. The ground beneath is known to be unstable. Teams must navigate through a grid of unsafe snow and plot a safe path for the team to follow. As you cross the glacier field you find yourself knee deep in snow. It becomes impossible so out come the snowshoes. Our snowshoes are team shoes, like giant skis. The team must walk like caterpillars in unison. Reports have come in of an imminent snow storm. Rather than battle it out the group must make camp. In the quickest time possible you must erect a storm proof dome tent and get the team in for immediate shelter. With snow comes polar bears. These are a protected species and cannot be shot. We must train the team with specialist laser clay stun guns. How accurate can you be as our giant digital scoreboard records your hits on target. After a recent avalanche your rations have been buried. You know rations are stocked at camp 2 however you cannot ascend until you have acclimatised! You must use a traditional form of hunting (bows and arrows) to hunt for fish! Serious fun, and seriously maneuverable, this challenge involves driving all terrain vehicles through land, water and snow (mud!). Avalanche protection is vital for your climb. In unstable territory you must blast away snow to prevent the avalanche. A detonation device is provided for the explosives; however you must crack the code to authenticate your identity. It's vital to stay warm on the mountain. To conserve body heat you must create fire. Matches are dangerous at such altitudes so fire must be created from natural material! Half way from Camp 2-3 you are hit with a blizzard storm. The team must venture on without vision. This challenge is about leading a group through the unknown in safety. You are all blindfolded for this task! Your pack has become very heavy from the climb. You have hit a shelf which you find difficult to climb with such weight. The only option is to hoist your rucksack up the face. This challenge teaches teams how to create pulley systems to hoist heavy weights with minimal effort. You've completed the tasks, been awarded rope and become as close to the summit as possible. Now is the chance to make that final push for the peak. The length of ropes acquired by the teams will determine how far up the mountain they have travelled. 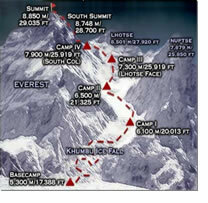 This is displayed on a large map of Everest. Teams must now make their way over the famous Hilary step onto the ridge and make for the summit (climb over our giant inflatable assault course). But it's not as simple as that. The team are all roped together and blindfolded. A lead rope goes over each obstacle of the course (as a lead rope guides climbers in safety to the summit). They hit safety points where they must unclip the rope from their safety harness; pass the safety bolt and re-clip onto the rope. As the group are all connected they have to work as a close team to move in unison considering each climber. Teams are provided with safety harnesses and carabineers, for effect not safety (there is no risk involved). Progressive Resources events are delivered to a high standard. All outdoor events are presented with safety bunting, activity signage and flags. All staff are experienced, trained members of the team with a friendly and flexible approach. Safety is our paramount priority. All of our activities have been comprehensively risk assessed. Each activity is briefed, instructed and overseen by an experienced, professional member of staff. Safety equipment is provided where necessary for each event. This includes crash helmets for motorised driving. All participants are covered to the highest level by £5,000,000 public liability insurance. All aspects of your event will be handled by an experienced Account Manager. Our service includes venue and catering management, 3rd party supplier liaison and full project support. We aim to leave you headache free with peace of mind that your event is in safe hands. So what happens if it Rains? We run a long range weather check 3 days prior to each event. If rain is likely then we supply additional cover marquees to field events to keep guests dry.